Sunpentown - SD-31E: Dehumidifier Review • The Air Geeks, reviews of air conditioners, dehumidifiers and air purifiers. Are you looking for a suitable dehumidifier for your room? The SPT SD-31E is a 30-pint humidity control unit that is suitable for small rooms. It can be used in small bedrooms, offices, living rooms, boats… you name it! As you know, even in small spaces, excess moisture can cause condensations on windows, mold growth, damage to household possessions, and rotting of wooden materials to mention a few. If you are planning to buy a dehumidifier for your room and you are considering this unit, we are glad to let you know that we have compiled all the information that you need to make a firm decision. Our aim is to help you get the best product. So let’s go, shall we? The SPT SD-31E is a compact unit that is suitable for small spaces. It is capable of drawing up to 30 pints of moisture from the air in 24 hours. It effectively removes excess moisture to create a truly comfortable environment in your room. Have you been struggling to eliminate mold and mildew from your house? If your room is relatively small, be sure that this unit will deliver an impressive performance. A simple and clean man-to-machine interface is always a plus! Depending on the relative humidity of your surroundings, your house can have high amounts of moisture. If that is the case, the unit can fill its small tank two to four times in a day. This means that you may need to empty the tank after every five to seven hours. Does the unit alert you when the bucket is full? Yes, the unit has a full bucket indicator that notifies the user to empty the tank. In case the tank is not emptied immediately, the unit shuts off automatically to prevent spillage. In high humidity areas, it can be a cumbersome exercise to empty the bucket. In such cases, it is easier and more convenient to use a hose to drain the captured water to a sink. Doing this enables the unit to run continuously without require your attention. However, this unit does not come with a tube for that, you have to buy one separately. The SPT SD-31E features a memory IC that enables it to start automatically after a power outage without requiring you to set it afresh. This alone is a feature that not many dehumidifiers have, and that makes a difference if you are not around when dehumidifying a space. Furthermore, it features a washable air filter that traps dust and other airborne particles before they get to your nostrils. What else, you ask? Well, this Energy Star rated dehumidifier has caster wheels that enable users to move it from one position to another with ease. Are you planning to use this dehumidifier in your bedroom? The SPT SD-31E is a relatively loud unit and it can be distracting when used in a quiet place. As such, it may not be a suitable humidity control system for use in bedrooms and living rooms. If you are intending to use it in your basement or laundry room, then this may not be a big problem. You can set the SPT SD-31E to continuous dehumidification or a desired relative humidity level (between 35 and 85%). However, we have observed that this unit has short cycles when the desired relative humidity is achieved. Consequently, the unit alternates between on and off and this can cause distraction especially if the unit is positioned in a quiet room. Fast dehumidification. This unit pulls a lot of water from the air within a short time. It effectively lowers the relative humidity to free your room from mustiness. Fan stops when the desired relative humidity is achieved. 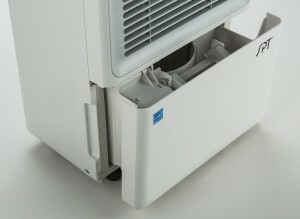 Unlike in most dehumidifiers, both the compressor and the fan stop running after the desired humidity level is achieved. This enhances the overall efficiency of the unit. Difficult to remove and return the reservoir. Emptying the reservoir can therefore be time consuming. High power consumption. Although it is clearly indicated that the unit has a high efficiency, we have noted that it uses excess power. When used continuously, it can use an average of 4 kWh per day. Alright, well I was on the fence about this little guy (it's relatively small) since I wasn't sure it would work all that well. Needless to say, it works great... though the on-board digital hygrometer is consistently +/- 5 points out of whack. Also, the manufacturer needs to learn about the concept of hysteresis. The problem is that when it reaches the specified moisture level, the unit stops immediately, which of course causes the humidity to rise immediately, and the unit to cycle back on. It does this on and off dance consistently, which can be annoying if you're trying to sleep in the room next door. This can be avoided by not setting the desired atmospheric moisture level too low. If this unit were reprogrammed with the proper hysteresis algorithm built in to it, it would keep going a few points below the specified moisture level, and then shut off. This would cause it to stay off until the moisture went above a few points over the specified moisture level, and would prevent the unit from excessively turning on and off (and consequently ruining your beauty sleep.) All in all, I would say... get a good digital hygrometer and keep it in the room with this guy, and set the moisture level on the unit to something reasonable based on your observations of the hygrometer." Positives: it does what it says it will do; you can set the humidity level you want (not just high or low, like some units); it's relatively quiet (see below); it resets itself to your settings after a power outage (or if you move it from one power outlet in your home to another one). Negatives: the bucket is very poorly designed -- it does not slide in and out smoothly; it fills almost to the very top, so spillage is a concern; it doesn't have any sort of pour spout, so you can't use the water to water your plants or anything like that, because the water just pours out over the sides and makes a big mess. The other negative is the noise level. I've only had this unit a little over a month, but it already has developed a vibration, which causes it to be fairly noisy. If I give it a good slap on the side, that usually solves the problem, but I'm wondering how much worse it's going to get over time. All in all, for what I paid for this unit (under $200), it serves the purpose." Having considered the features and performance of this unit, we can confidently conclude that the SPT SD-31E is a strong unit that performs quite well when used in a small room. It pulls water from the air impressively and shuts off when the bucket is full. Despite this impressive performance, we have established that this dehumidifier consumes more power than most units of same capacity. Furthermore, its tank is poorly designed and this makes it difficult for users to remove or return it. However, this cannot be a problem if you choose to use a hose. By considering its performance and features, this unit is worth its price and can be a good option if its drawbacks are not an issue to you. Air Geeks seal of approval!